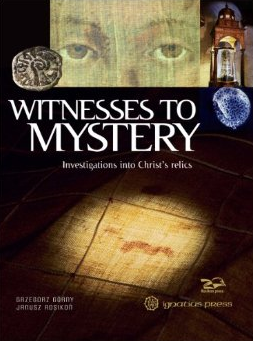 It’s called Witnesses to Mystery: Investigations into Christ’s Relics and it is by by Grzegorz Gorny (Author) and Janusz Rosikon (Illustrator). It is only available in a hardcover edition. The price at Amazon is $23.77. Grzegorz Górny is a reporter, essayist, and film and television producer. He is the founder and editor-in-chief of the quarterly Fronda, and from 1994 to 2001 he co-authored a program under the same title that aired on the Polish national television. He has produced various documentary television series and authored numerous articles for European publications. His books includeBattle for Madrid (2010). Janusz Rosikon is a photographer and a member of the Polish Journalists’ Association and the Association of Polish Artistic Photographers. His photographs have been featured in Time,Newsweek, and Reader’s Digest and various European publications. His work has been exhibited in public galleries in Poland, England, Austria, and North America. Dan you wrote: “(But is that a lepton in the upper left-hand corner of the cover?)”. NOT AT ALL! It is a dilepton or prutah not to be mistaken for a half-prutah or lepton. You still cannot correctly discriminate between dilepton (lituus) and lepton (didn’t you wrote a little sthg as allegedly ‘scientific’ bottom-line study re ‘crazy suff’?). Oops typo: didn’t you write…. Ignatius Press is a very good publisher, but the authors appear to have overlooked the fact that relics are only a part of the story. You mean Górny & Rosikoń? No, they haven’t overlooked that.